FamilyMeans is a member of the Alliance for Children and Families. 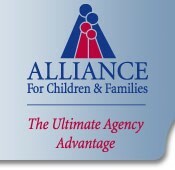 The Alliance for Children and Families provides services to nonprofit child and family serving and economic empowerment organizations. Motivated by a vision of a healthy society and strong communities, the Alliance works to strengthen America’s nonprofit sector and through advocacy assure the sector’s continued independence.